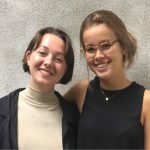 Joana from Germany and Antonia from Austria both decided to volunteer for one year at the Anne Frank House in Amsterdam after leaving school, supported by the German peace organisation Aktion Sühnezeichen Friedensdienste (Action Reconciliation Service for Peace) and the Austrian Gedenkdienst (Service of Remembrance). They wanted to work with other young people on racism, discrimination and prejudice. 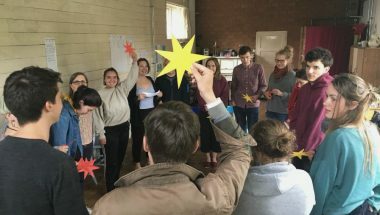 We thoroughly enjoyed our year doing all sorts of tasks for the Stories that Move team, but a highlight was being invited to present the tool this summer to 17 young Germans who were also volunteering in the Netherlands for ARSP. The topic of our workshop was “my own identity”, which was a good fit with this thoughtful, engaged group. What makes us to the person that we are? Which roles do I fulfill? What defines my identity? These were questions we asked ourselves at the beginning of the workshop. Each participant was given a paper star and asked to write “roles” that describe them on each ray of the star. Examples included optimist, activist, democrat, friend, open-minded thinker, vegetarian, day-dreamer. It is a Stories that Move activity from the learning path Seeing and being. Finding seven different roles or identity markers for ourselves was quite challenging, but in the end we had a great range and a perfect starting point for our discussion. After sharing the words on our stars, we talked about whether we choose some roles and how much our roles may change over time, or if some will never change. After hearing the stories of Wael and Laurens, who talk about their identities in short clips in the tool, we shared what we had felt while watching the videos – which are about a Syrian refugee living in Berlin and a young Dutch transgender man. We asked everyone to choose one word to describe their emotion for each story and then tried to find similarities and differences in the two stories. We ended with a lively discussion about the statement: You should always show who you are. The participants positioned themselves along an “opinion line” from strongly agree to strongly disagree. Most were towards the strongly agree-end, though all thought how much you can or want to show who you are differs from situation to situation. When the debate moved beyond us, the moderators, it felt like a great success and a good way to end our three-hour workshop. We encouraged the participants to start using the toolbox in their own work with young people. It was great to hear subsequently that Emma, volunteering at the antidiscrimination NGO Radar in Rotterdam, had done exactly that. Another little success!